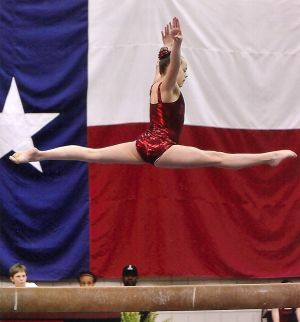 The developmental part of Southlake Gymnastics Academy's program focuses on developing a child's fine and gross motor skills as well as self-confidence. We emphasize fun and excitement while the class concentrates on developing a core group of basic skills on all four Olympic events (vault, uneven bars, balance beam, and floor exercise) as well as trampolines and loose foam pits. The director of the Developmental program coordinates week-to-week activities, the events, and the skills the classes are working on so that they remain fun and progressive for every child. This class is designed for the gymnast that masters what is being taught in the developmental program. The expectation level for these students is higher, and they will be exposed to more challenging skills. This class is designed for the gymnast that masters what is being taught in the accelerated program. The expectation level for these students is higher, and they will be exposed to more challenging skills.